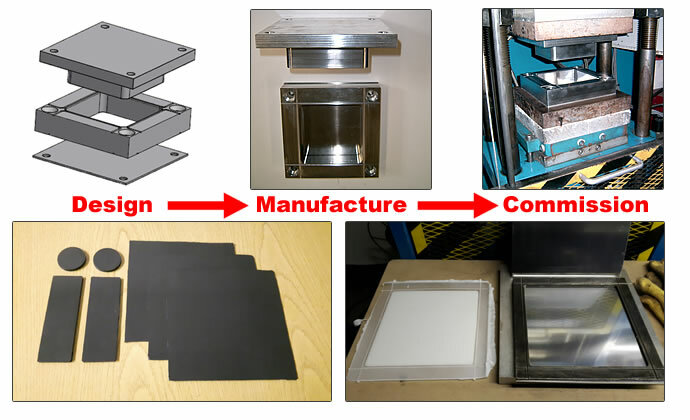 Gammadot uses a 10" square platen (single daylight) electric - hydraulic moulding press for both in-house moulding of test pieces for measurements such as PvT, Thermal Diffusivity & Room Temperature Density, and for providing additional services ranging from small scale contract moulding, to compression / transfer mould commissioning trials. The modern Moore press has 50 tonne maximum pressure range (controllable in two stages), and a temperature range of ambient to 400°C enabling the moulding of commodity / engineering thermoplastics, thermosets & elastomeric compounds. Gammadot has experience in the compression / transfer moulding of a wide selection of elastomer generic types ranging from NR to FKM, and thermoplastic plaque production in materials ranging from Polyolefins to filled PPS & PEEK.